Why Nobody Knows When He Will Die is a book that consists of ten stories on different subjects of everyday African and Liberian reality, many of which can be extrapolated to the rest of the world (bearing in mind cultural differences). The stories are written in the third person and are narrated in a precise, swift and entertaining manner. The plot is solid and the real-life dialogues are well framed. There is no doubt that the reader is in for a good time with Sankawulo, even if some of his stories are slightly childish, forcing the reader to believe some excessively naïve behaviour and other far-fetched dynamics. But that ‘mistake’ can be forgiven. Sankawulo also incorporates magical realism to narrate the stories. For instance, some characters rise from the dead. Let’s say that the stories narrated by Sankawulo are simple and surround every day life. The reader can identify themself easily thanks to the familiar, homey touches that Sankawulo likes to pepper his stories with. Hence, issues such as God, marriage, family and other every day matters usually fill the pages. From their tone, the stories are reminiscent of typically African fables, where power, tradition, ancestors and the community as a whole are of course of utmost importance. The ‘dictatorship’ of the community, for example, goes as far as stating in one of the stories (Too Mean To Live) that no human being should eat alone and will be condemned and ostracised otherwise. Similarly, the stories tend to conclude with the moral of the story, warning the reader that the path of evil takes you nowhere and that good always prevails. One example is The Boy Who Was Wiser Than His Father. The father can’t accept this humiliation, as it is also a sign of disrespect against the community and tradition. Yet that very same father also mocked tradition beforehand, by naming all of his sons after him. The father rallies his other sons and orders them to murder the ‘smart’ one, however, after many failed attempts, the son himself ends up killing his father. In the father’s case, the moral of the story implies, among other things, that disobeying tradition will not go unpunished, although it is true that the son, who also mocked the tradition somehow, came out unharmed. Nevertheless, the son represents the ‘good that prevails over ‘evil’, which is embodied by the father, and this factor outweighs the rest. In Too Mean To Live, the story is about a man who is such a scrooge that he always hides away to eat with his wife, so as not to have to invite anyone else to their home. He goes to the extent of even preferring to be tortured and die than to have to share his rice. Answered Prayers narrates the story of three brothers who still live with their parents although they are old enough to be married. The brothers decide to pray to God for a wife. But two of them change their minds and ask instead for a dog and a horse respectively. In the end, only one brother asks for a wife. But the ones who chose the canine and an old hack turn out to be the unlucky ones, whilst the one who prayed for a wife starts out very happy but things soon go pear-shaped. In view of the situation, two of the brothers decide to go to heaven, where they find happiness. Once in heaven with the angels, they sing praise to God. At last they are happy and freed from solitude, desires, frustration and all worldly qualms. In this story, women are not exactly represented in a positive light, thus demonstrating that machismo is another central theme in this book. It is not necessarily justifying machismo; it is simply showing the way things are in Africa in this respect. This story also indirectly suggests that God is the answer (heaven appears in many of Sankawulo’s stories as a place for salvation). Self-fulfilment is also of the essence. Another recurring theme of the book is marriage. It is mentioned in Answered Prayers but in Who Shall Take the Bride – a story with a surprising ending – the pressing need to marry takes centre stage. There is no way to tell which of the three suitors should marry a much-desired single woman from the community. 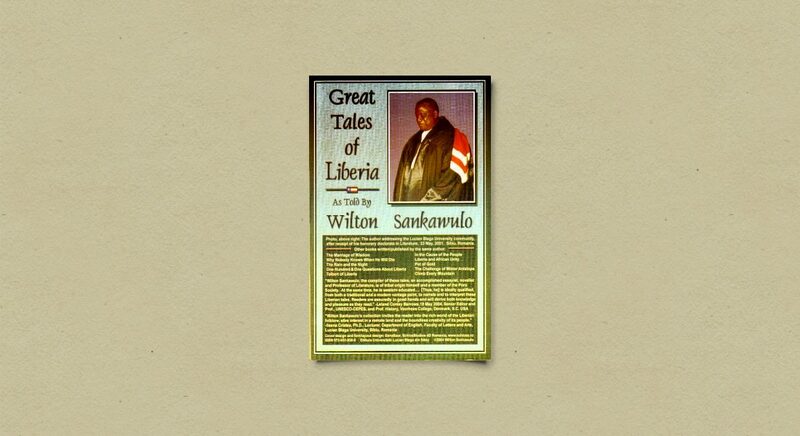 Sankawulo ends the story as follows: “Perhaps, dear reader, you could be the best judge of the case.” The Secret is about the war between the Golas and the Kpelles and about two brothers who have suffered the loss of their mother. After some time, the brothers find themselves in a forest where they are offered two wives, who are then devoured by the river but eventually salvaged. One of them will later die at childbirth. In spite of things having changed, one of the brothers decides to go back to war. There are clear elements of magical realism in this story. Another story, The Hunter’s Wife, relates the life of a very jealous man who gradually loses his mind, until one day, he is murdered in the forest. In the story that the book is named after, Why Nobody Knows When He Will Die, the issue of death is discussed. We are told that nobody knows when he will die because once upon a time, when people did know, a king who did not want to die at his stated time complained to God. He fought with death, which constantly came to remind him that he had to leave. In Had Animals Known, we are told why the leopard became the enemy of so many animals, while in another story, Mister Spider’s Charges, an eternal question arises: “Why does God allow so many misfortunes?” God justifies himself when Mr Spider goes to heaven and asks the question. God answers that his own sons died to prove to the world that death was not a tragedy but rather a way for children to come back home. In There’s Nobody Like A Parent, two sons leave their very poor parents behind on a mission to make something of themselves. At some point down the line they are taken in by a chief. The brothers test the chief’s loyalty only to find that he fails. In the end, the sons regret their actions and are eventually saved from death by their father (their mother had already died from a heart attack). The three of them end their days together. In sum, as described at the beginning of this review, you are in for a good time with this book.